sushi | Happiness is a warm oven. Happiness is a warm oven. A teaching, cooking, step-momming extraordinaire. I want to be M.F.K. Fisher when I grow up. Posted on April 30, 2011 by Jenn C.
Posted on December 28, 2010 by Jenn C.
Strange Sushi: Is that fish in your pocket or are you just happy sashimi? Sushi. Is there a more perfect food? Well, they don’t seem to have their own website, but here is a link from a Spokane tourism site: Sushi.com. 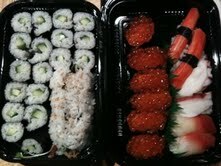 When we moved to Eugene, we scoped out the local sushi scene. I’d say we’ve been to most of the sushi restaurants in town, and it took disappointment after disappointment until we found Sushi Domo. It’s won a few awards for best sushi in Eugene–and it does live up to its high rating. And–the head sushi chef looks like a Japanese (McDreamy) Patrick Dempsey. That makes the sushi taste all the better. 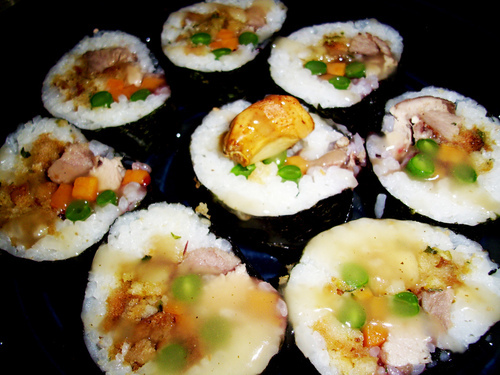 During my recreational food googling, I’ve come across several strange renditions of sushi. Peanut butter? Peeps? Yuck? I’ll let you decide. Play Sushi Cat: The Game! Want to make sushi? This tutorial covers it all. Posted on November 13, 2010 by Jenn C.
Quiche for Thanksgiving? Not so sure about that. I’d definitely rather have quiche for Thanksgiving than this monstrosity. Does anyone buy anything but Stovetop, anyway? Turnip puree with fried onions? Um.